The Windy Smithy is owned and operated by Jon Snow, who has been working with metal since 1996, and operates on a semi-mobile basis from the Blackdown Hills in Devon. 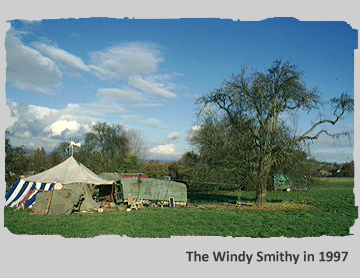 The first incarnation of the Windy Smithy was when, with the encouragement and support of Tony Murphy of Ynys Mon (Anglesey), a forge made from a gas bottle, powered by a wind generator, was set up on a small drove. The first products were hooks, pokers and exercises from the excellent book Edge of the Anvil, by Jack Andrews (ITDG Publications). Originally inspired by the desire to make quality hand tools for developing communities, he went on to study Blacksmithing and Metalwork at Hereford College, where the emphasis was more towards training Artist Blacksmiths, and a huge amount of wisdom was imparted to his little mind. Following college, the huge demand for affordable and efficient wood burners meant that a new and improved burner design evolved from an already superb pattern available at the time, and these have proved to be enduringly popular over the years, with improvements and new models being added every year. He has been making hand tools since being asked for a froe in the first week of blacksmithing, and has travelled extensively in Scandinavia, learning Edge Tool techniques from some of the best Norwegian, Swedish and Finnish toolsmiths. This was only possible due to the support of the Winston Churchill Memorial Trust, who gave him the opportunity of a lifetime to further his craft. Now the Windy Smithy produces a wide range of hand crafted products, from Gates to Axes to Woodburners, and even a towable living wagon.